The bangle bracelet is a fashion classic, always appropriate and in style. When people talk about a bangle bracelet, they generally mean a bracelet that is solid in form, rather than being formed of chain, links, or charms. Bangle bracelets can be made out of many materials, including gold horse bangle bracelets, silver horse bangle bracelets, wood horse bangle bracelets, and even glass horse bangle bracelets. How Should Bangle Bracelets Fit? 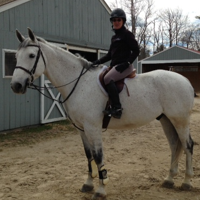 When you’re shopping for a bangle bracelet to add to your horse jewelry collection, remember that fit is everything! Bangles dangle – they’re meant to fit loosely around your wrist, able to move easily and gracefully with your body’s motion. Bangles that are too small will squeeze and compress your wrist uncomfortably. Bangle bracelets that are too large will slip off – usually when you least expect it! No one wants to lose a treasured piece of horse jewelry. Measure your wrist at its widest point, and use that measurement when shopping for bangle bracelets. If you love horse jewelry and bangle bracelets, you are in luck. Designers have been crafting exquisite bangle bracelets with horse motifs for years. Right now, we’re in love with this Victorian Double Horseshoe Bangle Bracelet. It’s crafted of fine silver, with simple lines and exquisite detail. Look closely at the double horseshoe: you’ll see the tiny horseshoe nail details in each shoe! The bracelet opens and closes easily and securely. This is the type of bracelet that you can wear anywhere: it’s elegant enough to pair with your formal outfits, charming and cool enough to wear everyday. 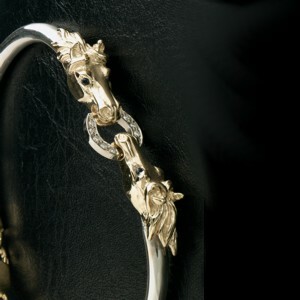 One of the most popular horse bangle bracelets we sell is this 14K Gold and Silver Horse Head Bangle Bracelet. Talk about classy – there’s a diamond ring connecting the two horse heads, sapphire eyes, and exquisite detailing. Matching earrings are also available for this bracelet.